97 Ebbot Lundberg & The Indigo Children - Where Are You Now? 26. Wilco - All Lives, You Say? 95. Spoon - Can I Sit Next To You? 48. Metallica - Atlas, Rise! 100. Yak - Harbour The FeelingClick here to edit. 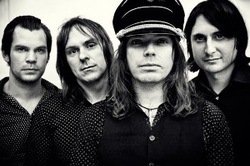 The new Morning Rocket show builds upon the unique and unrivaled rock music format that Rocket.FM has developed over the past two decades. It will also come to include other original segments, innovative programming and interviews, hosted live by the Rocket.FM on-air staff. No year is truly complete without the Rocket.FM Top 100 countdown. Tune in this Thursday and Friday, 7-8 January, as Rocket.FM counts down the 100 tracks that defined 2015 on the Rock Home of Stockholm. 79. Hello Saferide – Hey ho! off on New Year's Day at 17:00 CET. Nicke Andersson and Dolf de Borst stopped by the studio. Listen here.